The chassis comes with two high quality hot swappable power supplies. Either power unit can be removed without interrupting the chassis’ operation - offering total efficiency, maximum redundancy and minimum down time. Each converter is individually protected in the event of a problem on the bus or a power surge. Each converter can be removed or loaded without powering down. 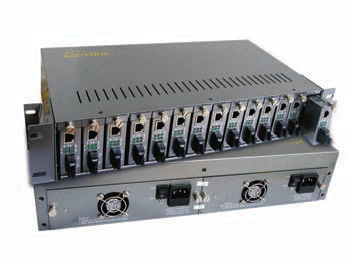 Our FT-R14 chassis provides 14 slots for a standalone 10/100M media converter, while the FT-R16 provides 16 slots for a card 10/100M or 10/100/1000M media converter. Our chassis are equipped with dual cooling fans and optional redundant power supplies to provide continuous operation. The Plug-and-Play and Hot-Swap features allow the installation or removal of the converter unit without powering it off.